Technologies for autonomous planetary mobility enable the rovers to make decisions and avoid hazards on their own. New path-planning software has helped the rovers avoid mission barriers. When rocks are unavoidable, the inherited suspension system allows for easier maneuverability. The twin rovers were designed to traverse with a fair amount of ease over the rocky martian terrain. Sojourner's "rocker-bogie" mobility system was modified for the Mars Exploration Rover Mission. 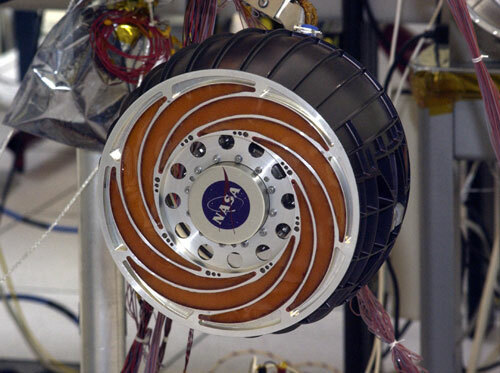 The wheels on Spirit and Opportunity are 26 centimeters in diameter (a little over ten inches) and made of aluminum. This up-close photo shows the spiral flectures which act as shock absorbers and the orange Solimide that fills the flectures, preventing rocks and debris from interfering with the driving and steering actuators. To account for the extreme difference in weight and center of gravity from Sojourner, the mobility system on the Mars Exploration Rovers is in the back of the vehicle. The wheels are, naturally, larger and have evolved in design. Each wheel is approximately 26 centimeters (about 10 inches) in diameter and has a unique spiral flecture pattern that connects the external part of the wheel with the spoke to absorb shock and prevent it from transferring to other parts of the rover. The rocker-bogie design allows the rover to go over obstacles (such as rocks) or through holes that are more than a wheel diameter in size. Each wheel also has cleats, providing grip for climbing in soft sand and scrambling over rocks. The "orange filling" between the spaces in the spiral flecture is an open-cell foam called Solimide. It was cut into crescent shapes and bonded to the wheel. Mobility engineers decided to fill in the open geometry design of the wheels to prevent rocks and debris from interfering with drive and steering actuators. Solimide maintains its flexibility even at very low temperatures so it is ideal for conditions on Mars. In order to drive themselves the rovers take stereo images, from which 3-D terrain maps are generated automatically by the rover software. Traversability and safety is then determined from the height and density of rocks or steps, excessive tilts and roughness of the terrain. Dozens of possible paths are considered before the rover chooses the shortest, safest path toward the programmed geographical goal. Having more physical capability than 1997's Sojourner rover, Spirit and Opportunity also needed more autonomy. Engineers improved the auto-navigational driving software to give the golf cart-sized explorers more freedom. When the rovers are navigating themselves, they get a command telling them where to end up, and then evaluate the terrain with stereo imaging to choose the best way to get there. They must avoid any obstacles they identify. This capability has enabled longer daily drives than would have been possible by simply depending on step-by-step navigation commands from Earth. As of mid-August, 2004, Opportunity has used auto-navigation to drive for 230 meters (about 755 feet, or one-third the distance between Eagle and Endurance craters), and Spirit for over 1250 meters (about 8 tenths of a mile), mostly during the nearly 3000-meter (nearly 2 miles) drive to the Columbia Hills. The auto-navigation system takes pictures of the nearby terrain using one of the Mars Exploration Rover stereo camera pairs (body-mounted hazard-avoidance cameras on Spirit, mast-mounted navigation cameras on Opportunity). After stereo images are taken, 3-D terrain maps are generated automatically by the rover software. Traversability and safety is then determined from the height and density of rocks or steps, excessive tilts and roughness of the terrain. Dozens of possible paths are considered before the rover chooses the shortest, safest path toward the programmed geographical goal. 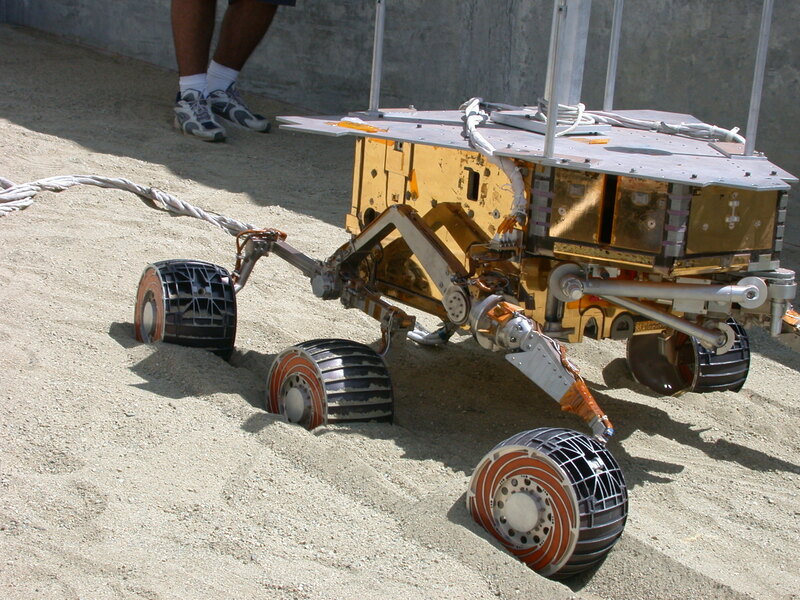 The rover then drives between 0.5 and 2 meters (1.6 and 6.6 feet) closer to its goal, depending on how many obstacles are nearby. The whole process repeats until it either reaches its goal, or is commanded to stop. The Mars Exploration Rover autonomous driving software is more advanced than Sojourner's in several ways. Sojourner's onboard safety system also looked for obstacles, but could only measure 20 points at each step; Spirit and Opportunity typically measure more than 16,000 points from each pair of images. The average Mars Exploration Rover obstacle-avoidance driving speed of nearly 34 meters (about 112 feet) per hour is ten times faster than Sojourner's. During its entire three-month mission, Sojourner drove just a little more than 100 meters (328 feet) total. Spirit and Opportunity each broke that record in a single day; Spirit drove 124 meters (407 feet) during sol 125, and Opportunity 141 meters (about 463 feet) during sol 82. Another improvement over Sojourner is the Mars Exploration Rover Visual Odometry software system. As the rovers drive over sandy and rocky terrains, they can slip by unpredictable amounts - even backwards when driving up very steep slopes. But the Visual Odometry system helps by giving the rover a much better notion of how far it has actually traveled. It works by comparing pictures taken before and after a short drive, automatically finding dozens of features in the terrain (for example: rocks, rover tracks and sand dunes), and tracking their motion between images. 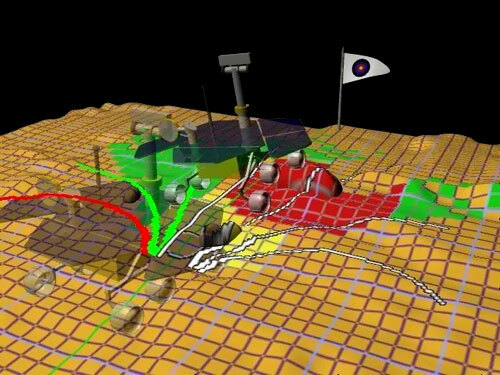 Combining that with the 3-D terrain shape is more than enough information to let the rover figure how it really moved, much more precisely than simply counting how much its wheels have turned. For more on visual odometry see the July 3-9 Week in Review.